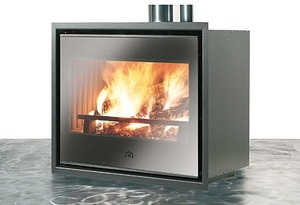 The Stûv 22 can be inset simply with a surround in anthracite steel (S4 frame). ... combustion values. Available with a steel or glass door in black. Discreet door handle in stainless steel. R SERIES - ideal for fireplace renovations. Inset Log effect Thermostat Remote control 1.2Kw Height – 595 mm Width – 498 mm Depth – 180 mm This fire will complement any room and provide warmth and a highly effective new lighting effect, Lumen*, which can be used with the fan heater on or off. A fireplace insert is a closed firebox designed to improve the efficiency of an existing fireplace while preventing the escape of smoke, dirt and odors into the room. Such inserts are designed to fit into a preexisting, traditional open fireplace. The variety of models includes those for single-sided, two-sided, corner or see-through, three- and four-sided fireplaces. Choice will depend on configuration and fuel type, which affects heat output and upkeep. A gas insert is very clean and efficient, but does not offer the charm of burning wood. Bioethanol and electric inserts do not generate cinders or soot, but give off little heat and are less ecological than wood or wood pellet models.